A 20mph area has been proposed for Hackenthorpe in Sheffield and the final decision on it was taken a couple of weeks ago. Local councillors, presumably responding to discussions with residents, asked for the speed limits of two main roads in the area to be included. Sheffield Road and Beighton Road, one of two through routes that divide the area (the other being Birley Spa Lane) were originally omitted from the potential 20mph area. Local ward members felt that residents should be consulted on their inclusion. A further letter was delivered to all properties in the area explaining this additional proposal. 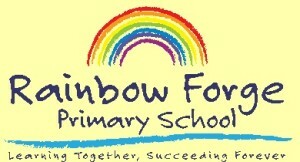 Rainbow Forge Primary School has their main entrance on Beighton Road, 71% of pupils walk to school. They say that there have been “numerous near misses or minor accidents” and that “the speed of drivers is usually the cause.” The school identified that the speeds of motor traffic outside their school causes parental anxiety, reduces safety and prevents more people from walking to school. The primary school supported the 20mph limit outside their school. As a school with a main entrance on to Beighton Road, we fully support the proposed 20mph speed limit. The road is a bus route and is very busy at peak hour times. Our parents park on the road as we have no parking area, so this adds to the congestion during school drop off and pick up. During this time there have been numerous near misses or minor accidents and the speed of drivers is usually the cause. Not only are parents trying to safely help their children in and out of the parked cars, we also have a number of families and older children who walk along the road, or who need to cross the road on their journey home. Our most recent ‘travel to school survey’ (January 2012) showed that the vast majority of our pupils (71%) walk to school. A lower speed limit, both on Beighton Road and in the wider Hackenthorpe area, would make this journey safer for our children and families, reducing anxiety for parents and help to ensure that no one is injured. We hope that this will help encourage more pupils and parents to walk to school in future. South Yorkshire Police submitted a formal objection to a 20mph speed limit on the two main roads included in the plans (included because residents and local councillors asked for them). [Available speed data] shows that the speeds on Beighton Road and Sheffield Road do not fall within the DFT recommended guidelines of 24mph. In fact all three sets old data show that well over 50% of vehicles exceed the current 30mph speed limit on this road with the 85th %ile travelling 37mph/38mph. There is obviously a long term issue with speed on this road. I also noticed that there is a vehicle activated sign on Beighton Road, which would confirm this. Within the guidance for setting local speed limits, it does state that where there is poor compliance with an existing speed limit on a road, or stretch of road, the reason for the non-compliance should be examined before a solution sought. I visited the site last week and followed vehicles travelling up and down the road. The speed of the vehicle in front going uphill from Moss Way was in the region of 32 to 35mph. However, vehicles travelling down the bottom section towards Moss Way were in excess of 50mph. I would say, that the road layout on this bottom section of Beighton Road did not make this speed feel uncomfortable at that time. As this proposed extension to the 20mph zone is unlikely to be self-enforcing without some major engineering works, and does not fall anywhere near the DFT recommended guidelines of 24mph, and that to achieve compliance there should be no expectation on the police to provide additional enforcement beyond their routine activity. I feel that we must formally object to this section of Sheffield Road and Beighton Road being included within the 20mph zone. The council say that “people contacting the council to express a view regarding the proposals for Sheffield Road and Beighton Road have generally been supportive” of the ideas. However they say that “[council] officers share the concerns of the police and objectors regarding its inclusion within the 20mph speed limit area”. Whilst acknowledging that people contacting the council to express a view regarding the proposals for Sheffield Road and Beighton Road have generally been supportive, officers share the concerns of the police and objectors regarding its inclusion within the 20mph speed limit area. There’s a lot of discussion in the report about why the officers are concerned, these include DfT guidance, talking to other local authorities, and the need for speed limits to be realistic, for speed to be reduced to an acceptable level, ‘complementary traffic calming measures’ would be needed, and there is no funding for this. 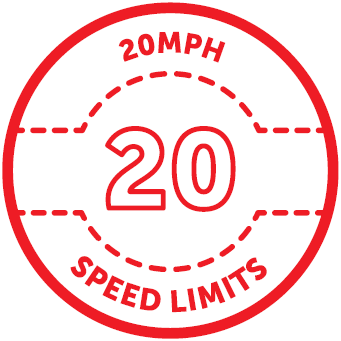 In the absence of funding for complementary traffic calming measures a 20mph limit would be artificially low and likely to result in excessive abuse and bring 20mph limits in general into disrepute the existing speeds. However, an alternative option is considered, and that is to provide an advisory, part time, 20mph speed limit. An advisory speed limit! It’s clear to me that there are problems with our approach to traffic safety on main roads. Local residents know that something is wrong and want change. 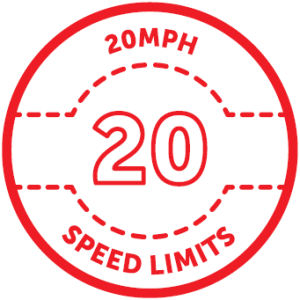 We have funding to provide 20mph speed limits, but these will only be placed where average speeds are less than 24mph. We will provide advisory speed limit signs where speeds are too high, but it’s not clear to me what benefit an advisory speed limit will provide if people can ignore it. For main roads we need to provide physical traffic calming measures, but the funding isn’t there for these. And we have key destinations (schools, shops, workplaces) positioned along these main roads that people have to get to, and won’t be moved in a hurry. It’s a chicken and egg scenario. The trouble of living somewhere where more cars leads to more fear, which leads to more cars. And not being able to do anything about it. The report I’ve been quoting from is here. This entry was posted in 20mph, Uncategorized on January 26, 2015 by Matt.